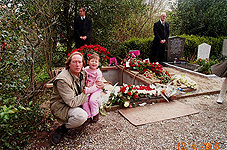 DEN ILP - Artist Anton Heyboer, uncrowned King of Angel Art, has been buried at the cemetary of Den Ilp. Anton was 81 years old when he passed. He died in his sleep during the night of Saturday April 9, 2005. "Anton died in full armour. He was not ill, he was exhausted. I do not know an artist who produced so much work. (It seems that over 80.000 painting are in lockers). Anton gave art all his energy and power." says Petra Heyboer, one of Heyboers 5 wives. My Life Is Art!" I hear Anton speak. Heyboer once said about his life 'the purpose behind 'my life is art', is to make my life into a work of art. My life is art, I don't create art. Because my life is art, it is the same with my wives, the women with whom I live." 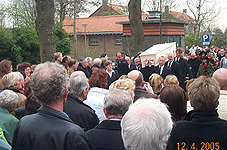 As soon as I heared that Anton had passed away I prepared to go to his funeral. I finished an angel drawing that I created for him in 1999, but had left undone. 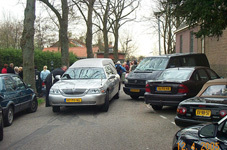 At the day of the funeral, we qeued up in a long row of cars clogging up the small road that leads through the tiny town of Den Ilp. 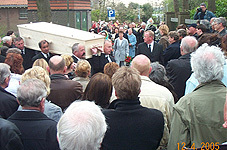 At 10:35 in the morning, on april 12, 2005, Antons' coffin was slowly carried to his grave. 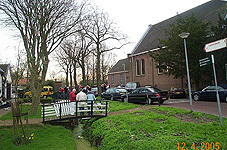 The entire funeral took place oustide, there was no service inside the church. A spokesperson spoke some words, his wives attended in silence. They had rather not buried Anton in public. A tape with Anton singing one of his songs was played. 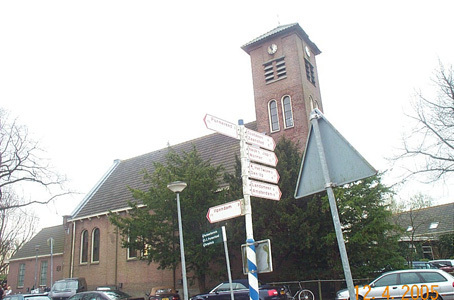 After the cemetary I presented my angeld drawing to Petra and went on to have a Heyboer sandwich in the local café. 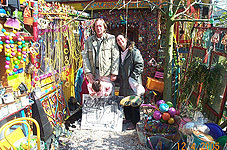 After that we visited Anton's Atelier and barn, the colourful happy home where he lived since the early 1970's. 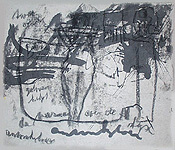 I purchased a magnificent drawing carrying the words of the Angel: 'geloven helpt' or "Faith helps." Here's a picture of it. Well.. Anton Heyboer is no more. 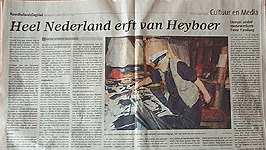 The newspapers state: 'Anton heyboer raised life to the level of Art' and 'The entire Netherlands inherits from Heyboer'.